Some New York harbor scenes. 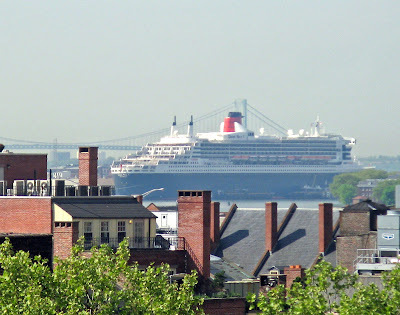 Queen Mary 2 at her berth in Red Hook, Brooklyn, May 8, 2009, as seen from the Manhattan ramp of the Brooklyn Bridge. In the foreground are the roofs and chimneys of 19th century buildings in the South Street Seaport district. The Verazzano-Narrows Bridge is in the background, and the bow of QM2 is obscured by the eastern tip of Governor's Island. 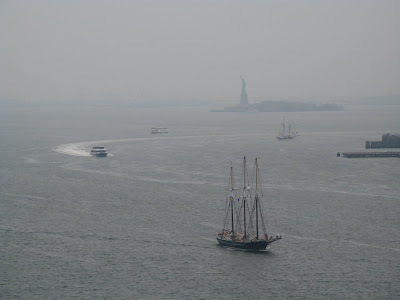 Two tall schooners seen from the Brooklyn Bridge on the foggy morning of May 1, 2009. In the foreground is a three-master headed into the East River. In the background, sailing around the southern tip of Manhattan toward the Hudson, is a two-master, South Street Seaport Museum's Pioneer. The Circle Line's Sightseer XII heads up the East River carrying passengers on an around-Manhattan Island tour on April 25, 2009. The boat is passing Brooklyn Bridge Park in the section of Brooklyn called DUMBO (for "Down Under the Manhattan Bridge Overpass"); the Manhattan Bridge is at the right. The South Street Seaport Museum's ship collection, as seen from the Brooklyn Heights Promenade on April 16, 2009. From left to right are: bark Wavertree; tug W.O. Decker; schooner Pioneer, with tug Helen McAllister behind (tall maroon stack with two white bands and black top); bark Peking; lightship Ambrose; and Gloucester fishing schooner Lettie G. Howard.